1. Put the olives, herbs and sunflower seeds in a salad bowl and gently toss to combine. 2. Peel the lemon and orange with a sharp knife, making sure you remove all of the bitter white pith. Working over a bowl to catch the juices, cut between the membranes of the lemon and orange to remove the segments and add them to the olives and herbs as you go. The segments should be small, so cut any large ones in half lengthways. Gently toss the salad and set aside. Reserve the citrus juices. 3. Set a chargrill pan over high heat – or ready the barbecue if that’s easier – and brush the bread on both sides with olive oil. Cook the bread until charred stripes form on both sides and then thickly spread the toasts with the ricotta. 4. Add 2 tablespoons of the reserved citrus juices and the 2 tablespoons extra virgin olive oil to the salad bowl and gently toss. Have a taste and add sea salt and black pepper, or more citrus juice or olive oil to taste. 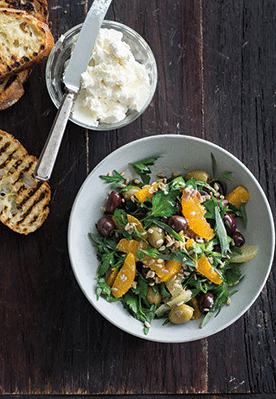 Serve immediately, with the ricotta toasts alongside – drizzled with a little extra virgin olive oil if you like. Recipe courtesy of Easy Mediterranean by Sue Quinn (Murdoch Books, £14.99). Photography by Alan Benson.